looking for DIY Surface Mount Balustrade Cable Kits? Measure the distance between the inside faces of the fixing posts in millimetres. TIP: You can run balustrade wires up to 10 metres passing through any intermediate posts to minimise the number of cables you'll need! The wires can run up to 10 metres in length and the threaded ball can be unscrewed allowing you to feed the cable through any intermediate deck posts (you'll need a clearance hole of at least 7mm). This deck balustrade wire system is designed for either timber posts or masonry wall surfaces using a 70mm countersunk wood screw. The socket is mounted to the surface feature by securing a screw or bolt into a drilled hole. If mounting to masonry surfaces please drill a hole and insert a plastic plug before fastening. Sometimes if a wall is particularly brittle or old - a chemical resin may be applied to further strengthen the hold. 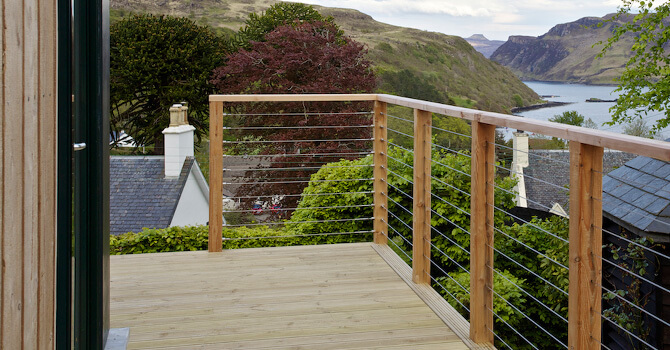 Preserve your view: An overall view of decking fitted with 4mm balustrade wire. 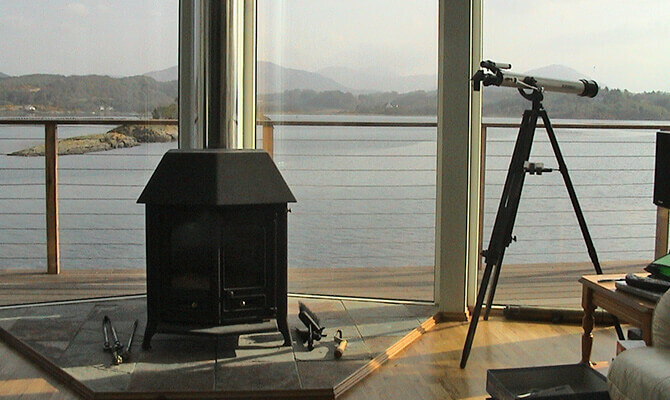 The cables give a sleek finish and provide and unspoilt view from the deck. Below is a close up showing the ball terminals fitting cleanly into the surface mounted sockets. 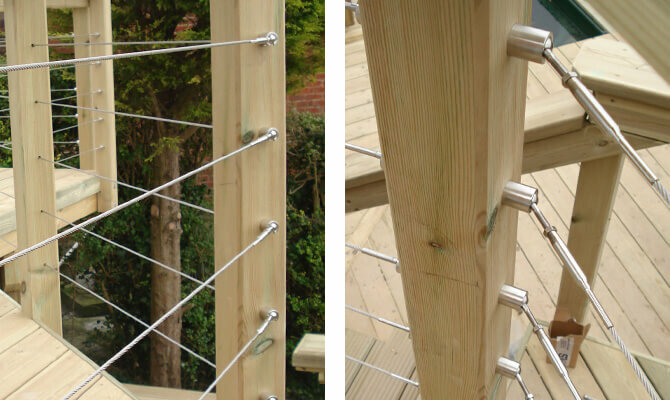 Photos below show how the deck railing cables can accommodate angles on decking by swivelling in its socket. The image below shows the balustrade wire passing through an intermediate post. 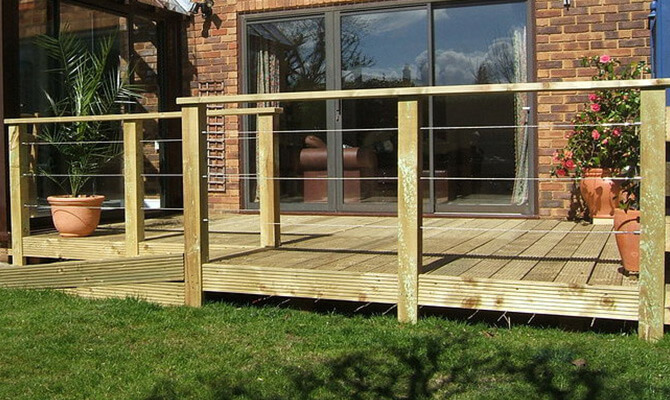 Our deck railing wires can run up to 10 metres and still achieve good tension. We recommend post spacing to be 1.5 to 2 metres apart. 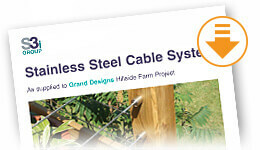 Horizontal deck cables should be spaced at 100mm intervals. This image shows adding tension to the deck railing wires with the tension adjuster that gives an adjustment of 20mm in each direction from your supplied measurement. Always a good product and quickly dispatched. A perfect fit every time. Really high quality materials and accurate manufacture.